▪︎ Series of drawings with mixed techniques along the Tiber of Rome. 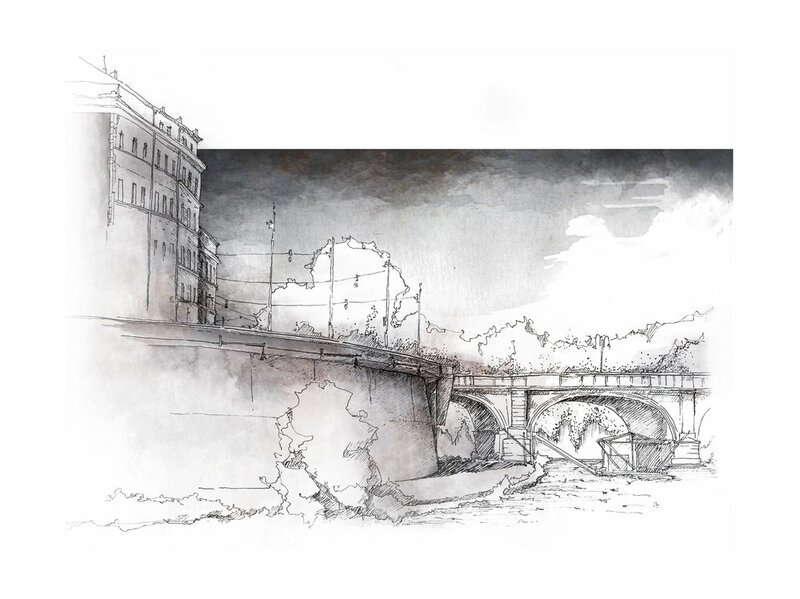 This series of drawings shows the Lungotevere of Rome and the buildings visible from the Muraglioni or from the bridges over the Tiber River. Some of these drawings are made with pencils and black ink, other ones are watercolors handmade, later colored with mixed techniques in digital environment where were hybridized all contributions. ▪︎ Series of traditional and digital watercolors exhibited at Paesaggi Ibridi, solo exhibition in Catania, Sicily. "In graphic product there is a distinction between the techniques connected to the materiality of the support which would render the digital environment inhospitable for representations that still have many debts with the analogic tradition of drawing. It is the case of watercolor drawings, where the unpredictability of water over a paper support would seem to make the process of creation of the color almost unrepeatable in a digital environment. Our attempt, as Atelier Crilo, was — and still is — to overcome this dichotomy experimenting digital techniques that look upon analogic tools with the same level of imprecision and unpredictability, trying to eliminate the presence of software and favouring a critical view in the creation and communication of architectural design." ▪︎ The cities of Venezia, Roma, Salerno and Vienna. Atelier Crilo's work has been exhibited at SicilCima space, highlighting the process that led us from analog to digital tools, introduced by means of video installations, canvas, sketches and hand drawings. A secret room at the end of the exhibition contains a site-specific work for Catania, named Etna (as the volcano of Mount Etna). Paesaggi Ibridi has been an exhibition curated by Salvatore D'Agostino and directed by Salvatore Gozzo within the cultural project of #‎futuramemoria‬. Paesaggi Ibridi, curata dall’architetto e blogger Salvatore D'Agostino, presenta a Catania il lavoro di Atelier Crilo, lo studio d’architettura italiano fondato da Cristian Farinella e Lorena Greco che si distingue in Italia per l’innovazione delle tecniche di disegno e di visual e creative design. Attraverso una modalità di lavoro a due tempi, operativa tra disegno a mano e disegno al computer, lo studio definisce nuovi paesaggi, ibridi disegnativi usati come mezzo per trovare nuove spazialità architettoniche e che ridefiniscono il concetto di paesaggio, per sua natura mai statico ma in continua evoluzione tra passato e futuro. La mostra e una lecture dello studio hanno inaugurato Futura Memoria, un programma culturale nato sotto la direzione artistica di Salvatore Gozzo e prodotto da SicilCima presso il nuovo store di Viale Africa 42 a Catania, concepito come contenitore di eventi, cultura e innovazione. ▪︎ Photos of the opening and lecture at Sicilcima space in Catania. The drawing of Etna (Mount Etna) offers an interpretation of the Sicilian landscape, a strip of land where the city of Catania reveals itself as a hidden transition between sky and sea and where buildings, streets and city landscape, are a continuous and undifferentiated system in the overall view. The city appears as a combination of interpretative and constructive layers, grafted on the lava rock — still visible through the narrow streets of the historic centre — and the predominance of the volcano is the absolute protagonist of the rare beauty of this landscape. ▪︎ Etna, cotton paper on dibond 58 x 63 cm. Digital coloring on sketch handmade. ▪︎ Video making of Etna that has been showed during Paesaggi Ibridi exhibition. ▪︎ Architectural renderings coloured with digital painting. Atelier Crilo's visualization research is based on the continuos balancing between digital and analog techniques. The contribute of various disciplines, starting from the paradigm of traditional arts and crossing the computer graphic, influences our visual approach in drawing and design. Above you find two short videos to introduce this relationship between digital and analog tools. The watercolor techniques, shown in the video workflow, are further explained in lessons, live sessions and workshops during the teaching activity in digital painting and post-production of the image. ▪︎ Illustration for the book by Aubrey de Grey - D Editore.